In fact, he embraced the title, rejoiced his child said it as his first word, and the actor personally claimed the title for himself. 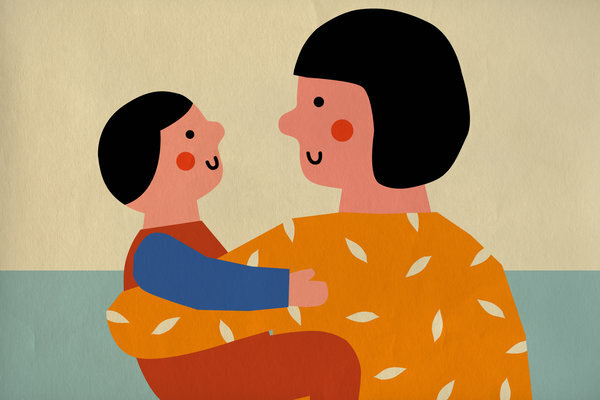 Heather Havrilesky, a writer for the New York Times, doesn’t embrace “mommy” quite as heartily. In this weekend’s Sunday Review, she takes umbrage at the fact that people sometimes refer to her as “mom.” When, for example, she was sitting at her kid’s soccer practice “contemplating the drift of gray clouds in the distance,” the coach interrupted her reverie by saying, “Moms, listen up.” Presumably, he was just giving the “moms” directions for the next game’s snacks, but it was enough to “send shivers” down her spine. She’s more than just a mom, she says, and doesn’t like the all-encompassing societal demands of motherhood. When she and her friends were at a bar, someone asked if they were having a “mom’s night out.” She smiled smugly at the regressive comment, because she’s not defined by the fact that she’s given birth. When smart women recoil against domesticity, it denigrates the maternal role: People usually don’t mind being defined by accomplishments. Take, for example, my husband. He’s a father (no, not a “fommy”), a Harvard Law grad, a Constitutional attorney, a New York Times best-selling author, and a Bronze Star recipient. He’d never try to distinguish himself above the others in the group. Rather, he’d take the glass and thankfully partake. Why? Two reasons: because he’s proud of his service and because he knows his identity does not reside within the details of his life. Even in the description of my husband that I mentioned above, I didn’t tell you that he’s an avid viewer of Homeland, that he auditioned out for Survivor, that he hates Taylor Swift’s new pop album, and that he has — several — level-90 Warcraft characters. David’s essence — believe me — is hard to quantify, and even his closest friends don’t “get him” in the way that I do. After eighteen years of marriage, I don’t “get him” in his entirety. Like all of us, he is more than his descriptors. In an uncertain world, we crave the security of knowing exactly who we are and where we belong. But too often as women, we try to find this safety in our roles and relationships, our professional accomplishments, or our picture-perfect homes. And as we do, our souls shrink smaller and smaller. One of the biggest misconceptions women have is that the goal of the gospel is to conform them to some culturally-accepted form of ‘womanhood.’ We equate spiritual maturity with certain family structures, nutritional and educational choices, and feminine ideals. A mature Christian woman looks like XYZ (insert your favorite stereotype). But the goal of the gospel is the same for both men and women. The goal of the gospel is to restore our personhood. This includes our gender, to be certain, but it is not limited to it. Christ is making you like Himself and as you are transformed internally, His nature will express itself in everything about you–from your womanhood to your gifting to the work you do. In other words, Havrilesky’s right. She’s more than a mom and she doesn’t have to mother in the way her friends parent to be “enough.” I’m sure Havrilesky doesn’t need or want a conservative writer to come to her defense. I’m sure she would disagree with almost everything I write. I also suspect she doesn’t believe that a relationship with God could help her overcome her deep seated angst at being called a “mom” by an overworked soccer coach who just needs to assign orange slice duty. I also agree with Havrilesky’s assertion that mothers need not succumb to certain societal standards. Only through God, can women rise above societal roles and live in divine fullness. In fact, only through God can men rise above the societal roles and live in divine fullness. In other words, the so-called “Mommy Problem” is not a “mommy problem” at all.